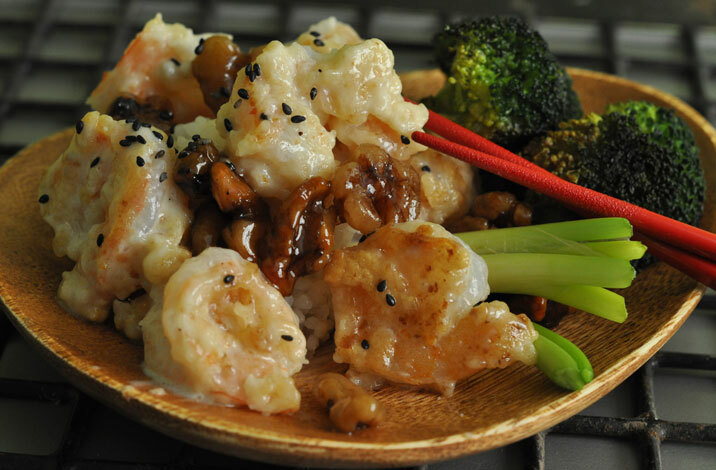 The ultimate guilty pleasure- honey-glazed walnut prawns! So, my last post was all about my resolutions and I even had a healthy eating recipe. This road to healthy eating is a treacherous one and sometimes one hits a pothole….or even falls off a cliff….Such was the case last week when I made honey-glazed walnut prawns for Miss G’s last night in Snohomish before heading back to school in Boston. What can I tell you about honey-glazed walnut prawns? I first tasted them in Seattle’s International District a few years ago. The rumor is that this dish originated out of Hong Kong. Who knew that Hong Kongers enjoy mayonnaise, too. So, the ingredients of this truly guilty pleasure may totally gross you out. But, trust me, you’ll love it. The kids will love it. And, if you wear elastic waisted leggings you may not feel your thighs dimpling as you eat it. Boil walnuts in 2 cups boiling water for 10 minutes. Drain. Bring 4 cups water & 1/2 cup sugar to a boil. Add blanched walnuts and cook for 10 more minutes. Drain. Combine walnuts & honey. Heat oil in a wok/ fry pan and fry walnuts for 1 to 2 minutes until brown. Dip shrimp in egg whites & then coat with flour. Fry shrimp in heated oil in wok/fry pan for 1-2 minutes. Remove shrimp. Combine the vinegar, mayo, condensed milk & sugar & add to the wok. Serve with walnuts & garnish with sesame seeds if desired.